The puffer coat has been around a while, but this 80's and 90's staple coat has a new identity in 2017. The original puffer coat style was basic - a quilted coat that has down insulation or synthetic fibers stuffed between the stitching (creating a puffed look). Depending on the fit and quality, the puffer-style coat can keep you super warm during the cold season. The puffer coat was popular in the 80's and 90's, but then became more synonymous with the slopes and less of a street-style. In recent years, designers have revisited, and completely revamped the puffer coat. From floor-length to cropped, hooded, peplums, loud colors, oversized shapes and asymmetric cuts, the puffer is anything but ordinary these days. 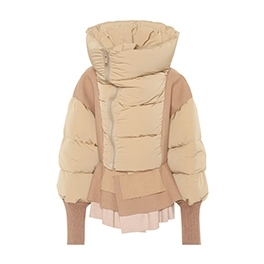 The beige-hued puffer coat by Undercover (available at Mytheresa.com) is one of my favorites. The collar is layered - you can zip it up to keep your neck warm, or let it fall on each shoulder for an oversized-collar look. The technical, ruffled fabric at the hem is a statement, and the combination of beige fabrics are light, and feminine. This Marques' Almeida puffer coat (available at Farfetch) is one version of the oversized style this season. There are three - waist-length, above-the-knee and a longer version. This one lands in the middle, is super-oversized and has a HUGE down-filled collar. I'm sure this will keep you warm. The asymmetric style dons the signature oversized safety pin (love that). Stella McCartney was at the forefront of the return of this style. 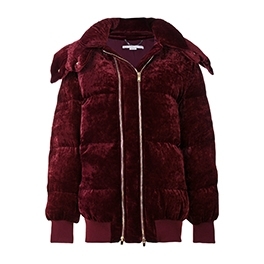 This dark red Stella McCartney double zip padded coat (available at Farfetch) is mid-length and slightly oversized. The 'parka-style' coat has two gold-tone zippers along the front, a hood and is made of luxurious, soft fabric. This deep red-hue is perfect for winter - so rich and warm. 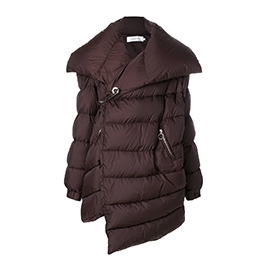 I can see myself wearing this liner padded coat by Rick Owens (available at Farfetch). 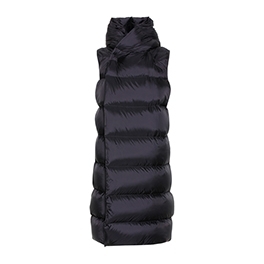 It's a subtle statement - a long puffer sleeveless style with a funnel neck that will keep you warm. I love vests in the winter. I'm a fan of knits and often sweaters and heavy coats are too warm (and bulky), but vests allow you to layer and layer.. If this puffer vest had a hood, it would be perfect.